The battle rages on and the Sharks just keep calling for help. 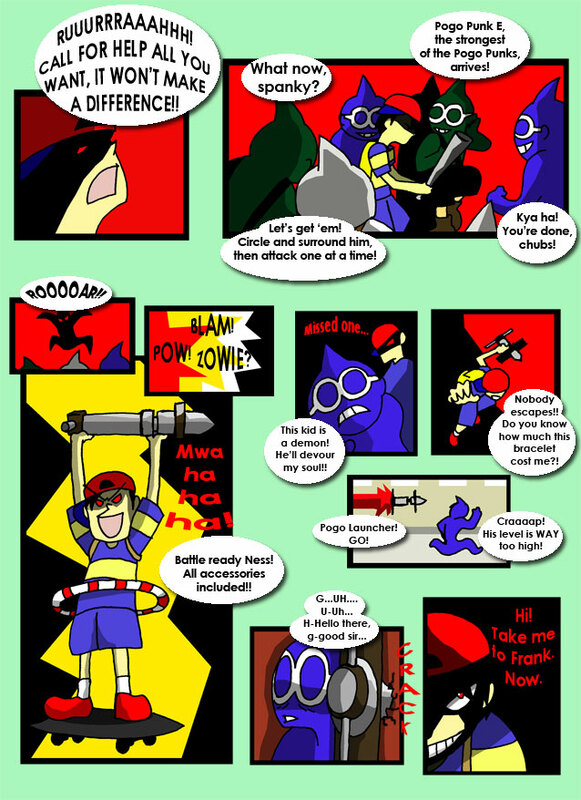 Ness equips himself with more than just his bat and brings down the house. Also, pogo sticks make great projectile weapons. Ness discovers the misfortune of fighting suicidal enemies and is blown high into the sky. I guess we'll never discover just who started the fire. It was always burning since the world was turning, I suppose. With a newly formed afro, Ness sets out to bring the funk! The residents of Happy Happy Village have no idea what's in store for them. And on that note, neither does Ness. Ness puts on his best face, literally, in trying to impress Paula. Good thing she wasn't in the mood for potato chips. The Franklin Badge is handed to Ness, who is all too eager to go beat up Carpainter, and Paula waits patiently as he goes out to fight an army of insane blue cultists. Did I mention I love this game?